We feel pleasure to introduce ourselves as the foremost manufacturers and suppliers of a CPVC Brass Threaded Elbow. The provided elbow is extensively used in residential and commercial buildings to fit in the pipes. Our offered elbow is manufactured with utmost perfection using the superior grade chlorinated polyvinyl chloride material and latest technology. The elbow provided by us is tested against several quality parameters by our quality controllers before dispatching it to the patron’s end. We are successfully meeting the requirements of our clients by offering a wide array of CPVC Brass MTA. Our offered product is manufactured under the guidance of our adept professionals from the supreme grade chlorinated polyvinyl chloride material and contemporary techniques as per the defined industry norms. Available in different sizes and technical specifications, this product is widely used in pipe fittings. Besides, the offered product can avail by our precious clients at budget friendly prices. We are the renowned company known for offering CPVC MTA to the clients. Offered range is manufactured using quality material and advance technology in compliance with market quality standards and norms. 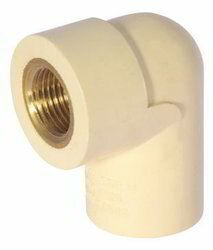 CPVC Brass MTA Pipe Fittings are provided in different sizes and specifications as per requirements. These products are used for pipe fitting purpose which is made using best grade PVC and brass material that assure strength, resistance and high efficiency. These products widely used in various industrial sectors. Our company is among the most sought after offering CPVC Brass FTA to the clients. These products are widely demanded in fitting applications in residential as well as industrial appliances. 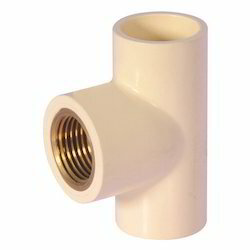 Offered range is used to provide perfect fittings to the extensions of the pipe. 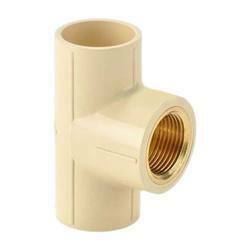 CPVC Brass FTA Pipe Fittings are available in varied sizes, qualities and can also be customized as per the need and requirement of our esteemed clients. These products are stringently tested on various parameters to ensure no defects. 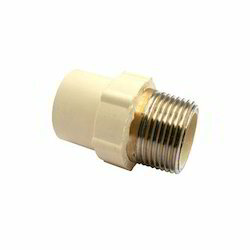 Our company is widely appreciated for offering CPVC Brass Male Adapter to the clients. These products are offered in various dimensions, thicknesses and shapes to select from. 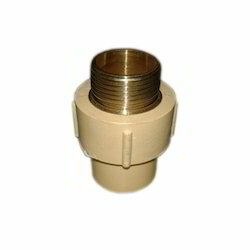 CPVC Brass Male Adapter are widely used for making the pipes of different types, molded fittings, electrical switches, doors and window profiles, etc. Offered range is made available in various specifications in order to meet the diverse needs of the clients. These products are extensively used in plumbing fitting applications and are manufactured using excellent quality CPCV material and pioneering technology. 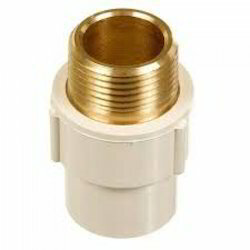 To retain our goodwill in clients' consideration, we manufacture, trade and supply a quality approved CPVC Brass Tee. Lead-free brass is not more than a weighted average of 0.25% lead when used with respect to the wetted surfaces of pipes and pipe plumbing fittings and fixtures. This hose fitting is easy to use for both contractors and the do-it-yourselfer. Do not over-tighten. A tee is the most common pipe fitting. It is available with all female thread sockets, all solvent weld sockets, or with opposed solvent weld sockets and a side outlet with female threads. It is used to either combine or split a fluid flow. We are Manufacturer of CPVC brass tee.